Summer is here at last and the season is in full swing — soaring temperatures, sudden thunderstorms, flowers in full bloom. The hubs and I spent the morning wandering around Paddington, a leafy suburb affectionately referred to by locals as “Paddo”. We pass through Paddo every morning on our way from Bondi Beach to Sydney’s CBD, yet in the excitement of exploring some of Sydney’s lesser known neighbourhoods, this gem has managed to fall off our weekend radar. 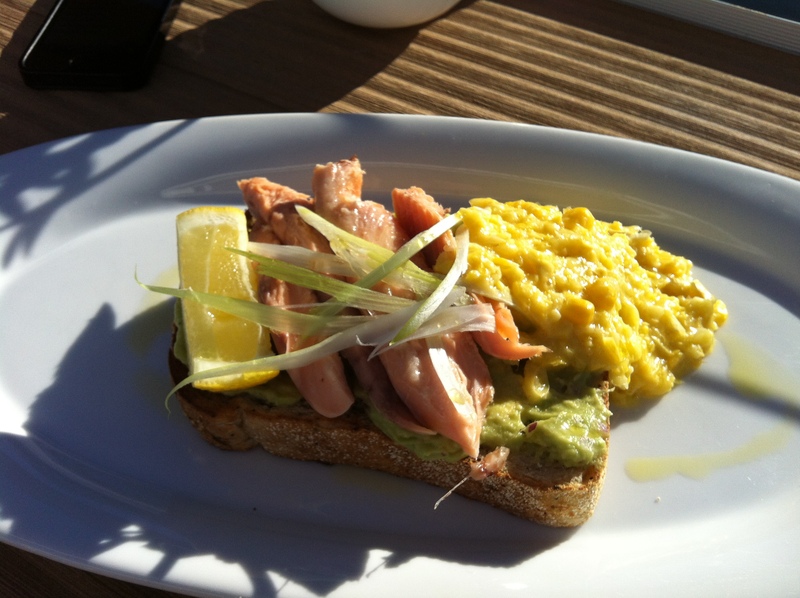 Breakfast was at Tiger Mottle, a cute, neighbourhood cafe, a few short steps from the heart of Paddo’s Five Ways. 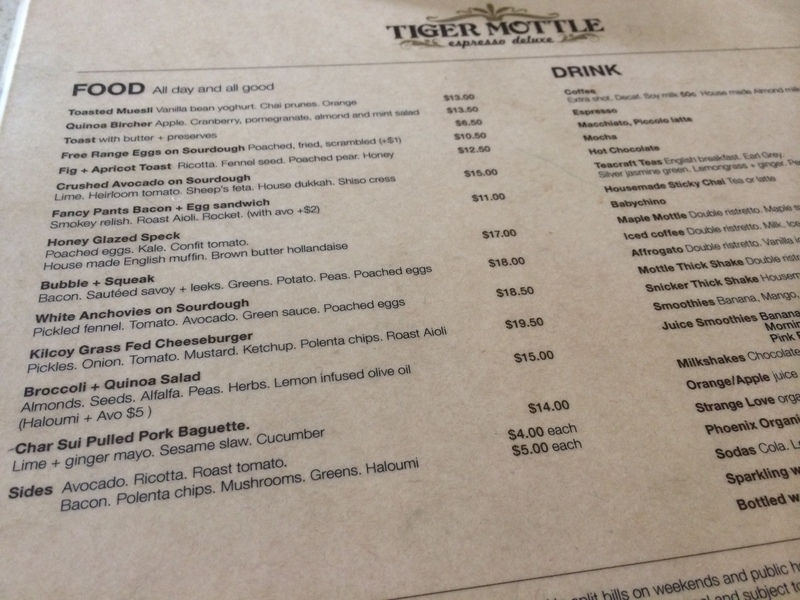 Tiger Mottle prides itself on a fresh, simple menu and strong, reliable coffee. They’re well known for their use of the double ristretto method, but the delicious aromas that waft out of their storefront on Glenmore are reason enough to visit. We’ve visited Tiger Mottle before but this was our first time sampling their food. In keeping with Sydney café culture, the menu offered up an array of egg and sourdough dishes with a smattering of avocado and seasonal salads. I was excited to also see quite a few innovative options, including Quinoa Bircher. I’ve been wanting to make a quinoa-based breakfast porridge, so this was a quick, no-risk way of taste-tasting the concept. Everything was delicious! There’s nothing more disappointing than a breakfast that leaves you feeling unsated. Luckily, Tiger Mottle delivers on its mantra (or really the “Mod Oz” mantra) of fresh, flavorful food, done simply and healthily. And to top it all, we got to sit in the cozy garden out back. This one’s a winner. After brekky, the sun peeked out and gave us some respite from an atypically overcast day. 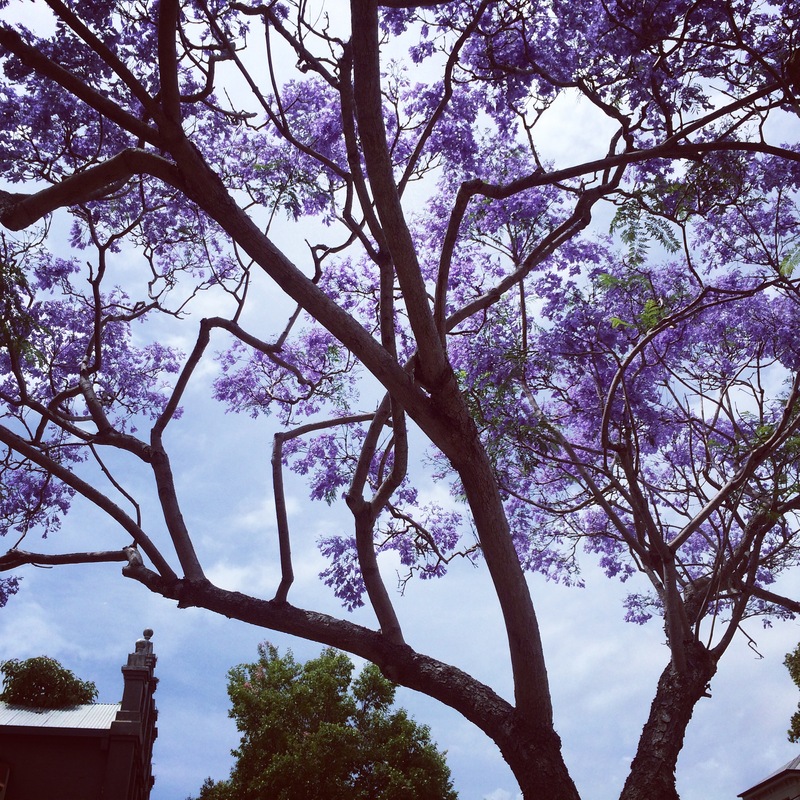 We wandered around and I snapped a few shots of green, leafy Paddo and some of it’s gorgeous summer blooms. Paddo reminds me a lot of London’s Nottinghill; the quiet streets and narrow, terraced houses make for a quaint, village-like feel. On a sunny day, Paddo’s dappled laneways could pass for something out of a Mediterranean postcard. After our beach epiphany last night, we decided to spend the day exploring Bondi and Bondi Junction and testing the commute to and from the CBD. We walked down to Circular Quay and hopped on a ferry to Rose Bay. Ten refreshing minutes later, we were strolling along New South Head Road and gazing out at the serene waters below us. 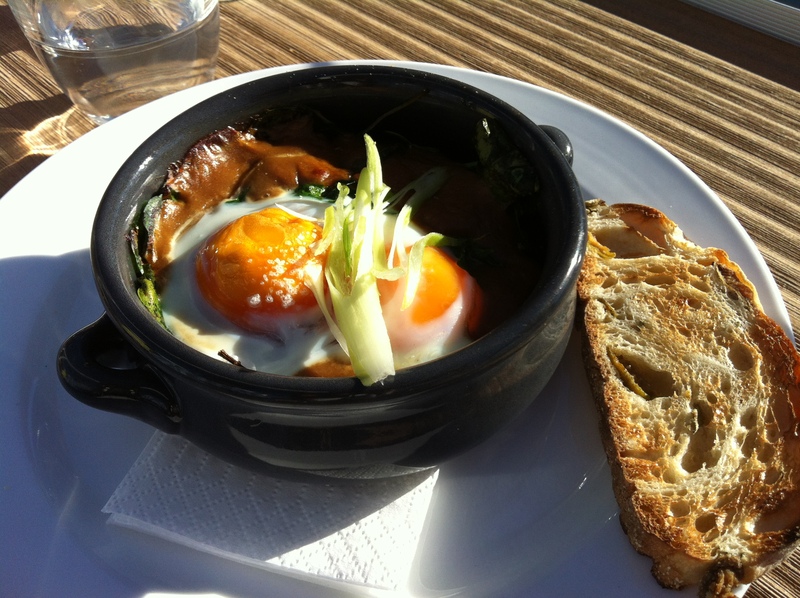 We settled in at The Swimmers Club for lunch and feasted on a delicious open face trout sandwich along with a dish of coddled eggs with portobello mushrooms, Sydney’s take on oeufs en cocotte aux champignons de Paris. 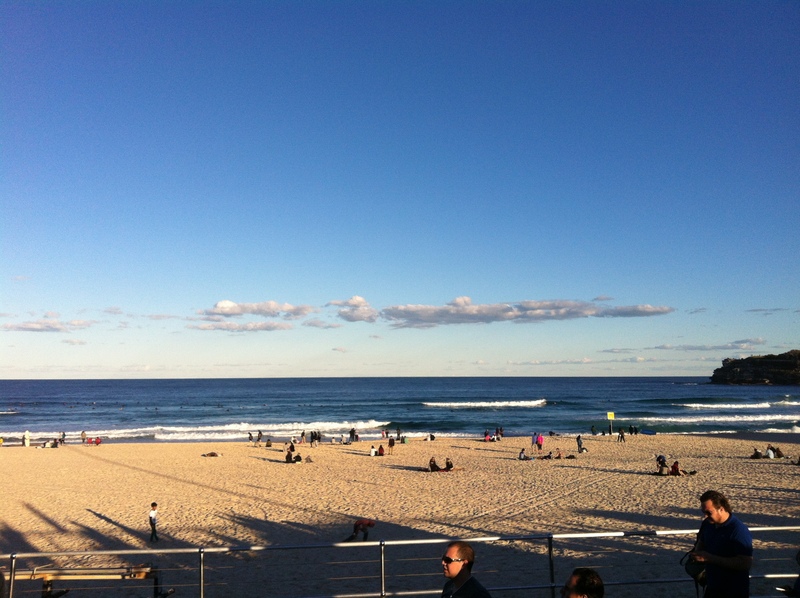 After lunch, we were able to hail a cab and to North Bondi Beach. Our plan was to walk from one end of the beach to the other while zigging and zagging through some of the inner streets. Campbell Parade, the main strip on the beach, is a lot quieter in the winter time. You’ll still encounter ample surfers and beach side activities but it isn’t as packed as when we were here in March. 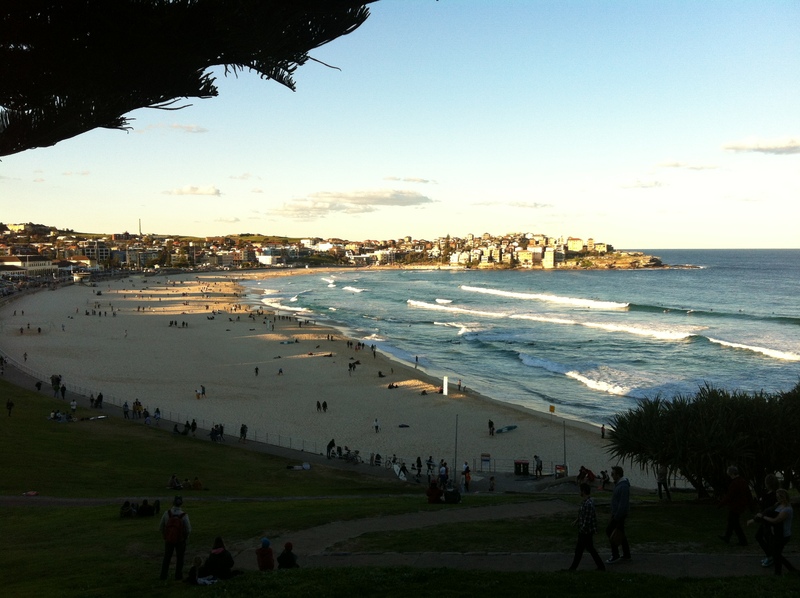 The walk along Bondi was awesome. Going even one or two blocks in from Campbell gets you away from the hubbub and into some fairly residential-feeling territory. It’s definitely bustling but I think, if anything, we’ll appreciate that, coming from New York. We walked up to Icebergs and took in the view from the top of the hill. I think we’re sold!